JACKSONVILLE, Fla. – Rookie cornerback, and former Florida Gator Vernon Hargreaves, intercepted two passes as the Tampa Bay Buccaneers recorded a 27-21 an NFL preseason victory over the Jacksonville Jaguars at EverBank Field. Trailing 14-7, the Bucs (1-1) scored on a five-yard TD pass from backup QB Mike Glennon to Mike James with 23 seconds left. Hargreaves first interception then set up a 28-yard field goal for a 17-14 halftime lead. The Bucs picked off four passes, including one by rookie safety Ryan Smith to clinch the win in the final two minutes. The Jaguars (0-2) had taken a 14-7 lead on two TD passes to T.J. Yeldon and Allen Hurns by QB Blake Bortles. Bortles was 8-for-11 for 84 yards. Hurns hauled in a 24-yard TD pass to finish off an 11-play, 80-yard scoring drive. Hurns recorded 10 TD receptions in 2015 and his 1,707 receiving yards and 16 receiving touchdowns are the most by an undrafted player in his first two NFL seasons since the 1970 merger. Third-year wide receiver Allen Robinson finished with 4 catches for 34 yards against the Buccaneers. Through two preseason games, Robinson has totaled 7 receptions for 114 yards. “I thought both of them did a really good job. They are obviously two guys who kind of make our offense go. They are the playmakers that can go up and make a big play at any moment. I thought we did a good job of kind of feeding each one of them the ball and letting them make the plays,” Bortles said of Hurns and Robinson. Yeldon capped the Jaguars’ second offensive possession with a 14-yard touchdown reception. Through two preseason games, Yeldon and running mate Chris Ivory have combined for 92 yards rushing on 18 carries. Both have been able to reach the end zone with Ivory rushing for a 1-yard TD against the Jets. Tamp Bay QB Jameis Winston was 3-for-10 for 28 yards. In the second quarter Winston led a 14-play, 75-yard drive that lasted 7:34 and culminated in a four-yard touchdown pass to wide receiver Mike Evans. “We got the coverage we wanted, man-to-man. We’ve been working on the fade all offseason and he threw a great ball – I didn’t even have to jump for it. He threw it out of the DB’s reach and I made the play,” Evans said. The touchdown pass was Winston’s second this preseason and the touchdown reception was the first for Evans this preseason and the second of his preseason career. Jacksonville got a touchdown in the final quarter as Josh Johnson intercepted a Ryan Griffin pass and returned it 79 yards for a score, cutting the Bucs’ lead to three points. The Bucs’ Roberto Aguayo, a second-round draft pick out of FSU, went 2-for-4 on field goals with misses from 33 and 49 yards. In addition to the 28-yarder, he connected a 34-yard kick with 1:28 left in the game and went 3-for-3 on extra points. Tampa Buccaneers scored 10 points in the final 30 seconds of the first half to seal the win. DRESS TO IMPRESS – The Jaguars first-team offense totaled 138 net yards (85 passing, 53 rushing) on 20 plays Saturday night against the Buccaneers. In two preseason games, the first team offense has produced 289 yards and scored 24 points on 38 plays. 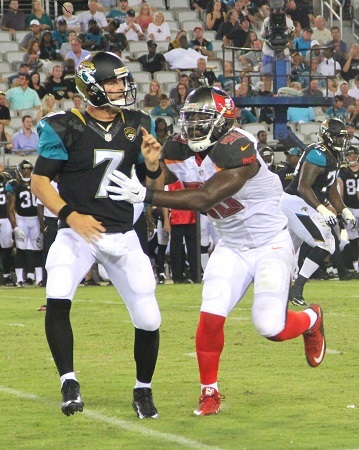 IMPACT ZONE – The Jaguars first-team defense played 16 plays and held the Buccaneers to 0 points and 65 net yards. Rookie fifth-overall cornerback Jalen Ramsey led the defense with three tackles in the first quarter, including one tackle for loss. HOME DEBUT: Fifth-year punter Brad Nortman made his home debut at EverBank Field with a 64-yard punt on his opening punt in the first quarter. 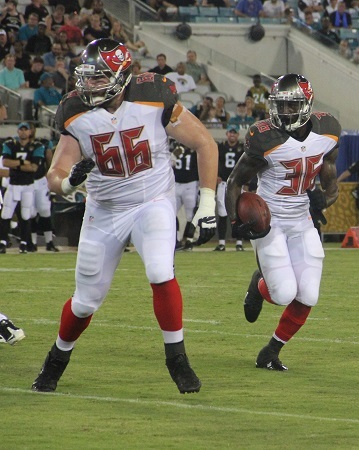 Nortman was acquired in free agency from the Carolina Panthers. Nortman has a 45.2-yard career gross avg. and a 38.9-yard career net average. KEY GRAB: Fourth-year cornerback Dwayne Gratz intercepted Winston on the second defensive series, which led to a six-play, 58-yard drive that culminated with a 14-yard TD pass from Bortles to Yeldon. Gratz has three career interceptions since being selected in the third round of the 2013 Draft (64th overall). STORM WARNING – On the first play of the fourth quarter, former Jaguar Storm Johnson scored on a one-yard rushing touchdown, finishing off a 10-play 79-yard drive that lasted 4:38 and gave the Buccaneers a 24-14 lead. It was the first preseason rushing touchdown of Johnson’s career. PICK TO CLICK: Tampa Bay cornerback Johnthan Banks recorded his first career preseason interception in the fourth quarter, picking off Jaguars QB Brandon Allen at the Jacksonville 47-yard line, returning it 19 yards. On Jacksonville’s final drive of the game, DB Ryan Smith intercepted Jaguars QB Max Wittek’s pass at the Jacksonville 38-yard line and returned it eight yards. It was the first preseason interception of Smith’s career. BUCS NOTES – Tampa Bay finished the game with four interceptions, their most in a preseason contest since intercepting four passes against Miami last preseason. The Buccaneers rushed for 158 yards, the most they have rushed for in a preseason game since 2013 (158 rushing yards at New England, 8/16/13).